Favipiravir - a trial drug currently being tested against Ebola and influenza - has successfully treated norovirus infection in mice. Known as the winter vomiting bug, many of us may be familiar with this pesky pathogen that leads to millions of people being locked to lavatory seats for longer than they'd like every year. Ian - Norovirus is probably the most common cause of gastroenteritis in the UK. It's a stomach bug and it causes vomiting and diarrhoea. It infects individuals through the faecal-oral route, or through aerosolised vomit. Chris - Why is there currently no treatment or no vaccine for it? Ian - Human noroviruses, we cannot grow them in the laboratory. So, it makes it very, very difficult to understand the biology of these viruses and that's probably the main reason we don't have vaccines or antivirals as yet. Chris - ...and in this new study, you think that you may have a drug here which will prevent people getting noro in the first place or cut down the period of time that they're suffering with it and so on? Ian - The main benefit of having this drug would be to treat people who are chronically infected. So, there are certain number of individuals in the population who are immunocompromised. So, they may be undergoing treatment for cancer and this means that they can get norovirus infection for months or even years. 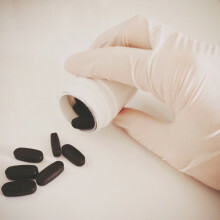 It's particularly that cohort of patients with this drug will be of particular use. Chris - What did you do in order to investigate its action? Ian - So, we have a mouse model of norovirus infection, of persistent norovirus infection where mice get an infection in their intestines over many, many months and we treated a number of animals with this drug. We're able to show that in some cases, it was able to clear the drug and lead to the animals reduce shedding a virus from one animal to another as well. Chris - Do we know how it does that? Ian - The way the drug actually works is by introducing so many mutations into the viral genome that the viral genome no longer functions properly. So, the virus is effectively mutating itself to death. Chris - How do you make sure that that only happens to the virus and not one of our own cells because the same thing, if you mutate our own cells, we get cancer? Ian - That's true. So, the drug itself is a class of molecules, which are known as nucleoside analogues. So effectively, it looks very similar to the building blocks of the viral genome and this is RNA. It's specifically copied into the viral genome only by an enzyme that the virus makes. So, it isn't incorporated into our cellular DNA or our RNA for example. Chris - The idea being then that you end up with the viruses that are in the body are just not viable anymore. Where would that be useful in helping the individual who takes it or could it be used for say, controlling onward spread of the virus? Ian - One of the other areas we think this type of drug might be of use is where you've got an environment where it's difficult to move individuals. So particularly, in old people's homes, so you wouldn't necessarily treat the infected individual but you would treat all the healthcare workers. You might come in contact with them and in all individuals you might share a common space. That's where we think it will have a real impact as well. Chris - Briefly, we mentioned at the beginning that this may also work for Ebola. Why do we think that? Ian - Well, it works against any virus in cell culture whose genome is made up of RNA and there's some very nice studies also performed in mice that showed that the drug will also work cure infection in mice. 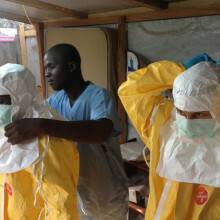 It's actually been used to treat some of the patients that have been infected with Ebola in the ongoing outbreak. Scientists have modeled and predicted a solar storm, which could have implications in protecting us against severe space weather events. With cases of Ebola having now spread to New York, scientists in America have now developed a cheap and simple test which could be used on the virus. It uses just a piece of paper and gives an answer in under 20 minutes. The Harvard-based team found that cells in a dish can be engineered to make them undergo a colour change when they come into contact with the genetic material of Ebola. If these cells are then broken apart and freeze-dried onto pieces of paper, all of the chemical machinery of the cells remains intact and stable for long periods at room temperature. To make it active again, you just add water, which can be in the form of a sample from a patient. Jim - What we specifically have done is, created now sensors that can detect the presence of, for example, antibiotic resistance with the presence of pathogens including viral pathogens. You could take a sample from a patient, spot them on a paper disk that's been prepared with our material and see if it changes colour. If it changes colour for example from yellow to purple, that indicates that you may have a resistant bacterial infection or you may be infected with a certain virus. Chris - This means presumably, you could use some of the components in the cells to do for instance, paper-based tests or to do chemical reactions on a piece of paper that would be really easy to store and transport. Jim - That's correct. What we discovered is that you can take the materials inside a living cell, spot it on paper, we'll flash freeze them and you now have your prep. We can store them. Keith had stored these for many, many months in his desk drawer. He can then take them out. We then would just rehydrate them with something as simple as water and either have a trigger that might be a molecular component that we want to detect or chemical that we want to detect in order to see if something is present and/or to initiate the reactions with the machinery that are spotted on this paper disk. Chris - Now, turning to something which is dominating the headlines all over the world and has done for a number of months now, that's the Ebola crisis. One of the really big frustrations for people working in West Africa is the lack of rapid testing facilities. Could you take what you're doing here and produce a piece of impregnated paper so that people would have a rapid diagnostic for Ebola cases? Jim - In principle, yes. As one of our proof of principle demonstrations in our paper, what we did was, in a matter of just 12 hours, develop 24 different sensors using some of the engineered machinery that we invented to detect an element of the virus that will be produced. Our system could give you a readout in 20 to 25 minutes. They cost just pennies and these sensors could detect very low amounts of the virus. Now mind you, at present, this is an academic exercise. This platform is not yet ready to be distributed into the field and used in clinics around the world, but we are confident that this could eventually form the basis of a rapid diagnostic test for various pathogen outbreaks including Ebola. Chris - What is the output? In other words, when you do say, a pregnancy test, everyone knows they're looking for blue lines on a white background, when you run one of your tests, how do you know what is a positive and what is a negative? Jim - It depends on the system that we setup, but the one they were most commonly using is, we have developed a sensor that when it turns on, it would produce an enzyme that will change the paper colour from yellow to purple. Chris - Could you also use it to look at the body's own biochemicals? For instance, could you do a test on somebody to see if they had X level of something in their body or they were carrying a gene which gave them risk of Y disease? Jim - Yes, so going beyond just say, infectious disease applications, we've shown already that you can use this to for example, sense physiological levels of glucose in a given sample. We're able to spot and already engineered glucose sensor onto paper and have it function in response to very low amounts of glucose and actually give you a readout of how much glucose is present. One could also envision using this in order to sense and diagnose the presence of complex diseases such as cancer. Type 2 diabetes affects around one in ten of the UK population and costs roughly £1 million per hour to treat. Diabetics can't control their blood sugar levels properly because they can't make enough of the hormone insulin. One way to manage the condition is with strict control of weight and dietary intake. David - We've based our drug on a sulfonylurea which has been around since the 1940s. It was discovered just after the World War. 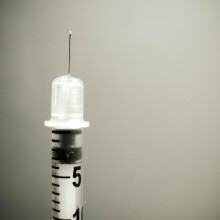 What this drug does is it binds to cells in the pancreas and increases their ability to release insulin. So, what we've done is we've taken this drug and we've made it photoresponsive. So, that means it becomes active when we illuminate it using a light. Kat - Can you show me then? How does this work? We've got some pictures here. David - So, this is basically the molecule here. This is the 3 dimensional structure of the molecule but what you will see is that when we light the molecule, it changes shape. So, when it's illuminated, the molecule becomes smaller and this increases its ability to function in the pancreas to release insulin. Kat - It's bent in half and that makes it more effective basically. David - Essentially, yeah. The reason it does this because it contains a special chemical structure called an azobenzene. Most people are familiar with these structures because they're used in dyes. They're very colourful so they can be purple, they can be orange. But the reason they're colourful is they absorb light. So, it's this property which we've taken here and inbued upon our molecule. Kat - Then what happens? You've got this molecule that bends in light. So, how do you get it to where it's needed? David - At the moment, we've only really sort of looked at this in vitro sort of in test tubes and in tissue from human donors. But what we do know is that when you apply - this is an example here. You can see nothing happens to the cells in the pancreas. This is a recording here. As soon as we switch the light on, you can see the cells beginning to flash and flicker, when the cells are flickering like this, that means they're releasing insulin. Essentially, we can turn it off. I've just turned the light off now and these cells are doing nothing. So, we can switch it on and off very quickly to increase how the cells activate to release insulin. In terms of using this in humans, well we're obviously quite a long way off. I mean, this is not sci-fi. This functions well in the lab but we need to figure out ways in which we can non-invasively deliver light into the human body. Kat - Yeah, because your pancreas is quite deep inside and then how you get to blast it? David - I guess one of the other problems with diabetes is that it's mainly associated with obesity. So, you've got to get this light into some fairly large abdomens as well. But one of the beauties about this compound is it's extremely light sensitive. So, it only needs a little bit of light to activate. So theoretically, you should be able to get light through into your abdomen. I mean, a good one is when you were a kid and your parents let you camp in the garden with your mate and you've got a torch. So, you stick the torch in your mouth and you illuminate it in the dark and you see instantly - light obviously penetrates through the skin, but whether we can get this into the abdomen, we need to begin to investigate and we're currently getting those studies underway to see if this is going to be a practical possibility. Kat - Say that it does work, what could be the benefits of making this much more targeted? David - One of the benefits is that, when you think about a drug, it's like taking a sledgehammer to crack a nut. It's going to work on its receptors in many different tissues throughout the body. This causes side effects, undesirable side effects. So, being able to target a drug to where it's needed is incredibly important as a refinement to treatment. But also, it allows you to switch on and off drug activity when required. This is particularly important here because if you think about it when you need to release insulin, it's after you just ingested food and had a meal. So ideally, you would switch the drug on, release insulin after you've ingested food and then switch it off. This stops you kind of overstressing the cells and releasing too much insulin. Kat - So, you can almost imagine sitting down and you have your meal and then quickblast of light, off you go. David - Exactly, yeah. They'res some way off, but I mean, the hope would be, you would sort of have like some LEDs attached to you, something no bigger than a Nicorette patch or something like that and then you would literally just remote control it. you would just switch it on using Bluetooth or your telephone and then this would switch the drug on and allow you to pack away the glucose. So, it's not causing any undesirable effects. Its one of those problems that have plagued us for generations and for which nobody seems to have had the answer: why do we get ingrowing toenails? Despite the best efforts of manicurists and chiropodists, they always seem to persist and it can be very painful to chop out the offending bits of intruding nail. They can also cause serious infections for people with diabetes. Cyril - Essentially speaking, from a physics standpoint, you've got two stresses: an addition stress and a growth stress. In physics, if you want simple, normal conditions, you need to make sure that all the stresses can balance each other. But in some cases, this balance between the growth stress and the addition stress don't balance each other. This can lead to a sort of an excessive force which will have a tendency to buckle the nail plate. As a result of that, you may develop some well-known conditions like in grown nails or pincer nails. Tim - Sounds painful. When the forces on your nail are out of balance, you're at risk of getting a painful nail condition. But the way that you cut your nails can help. Cyril - There are ways of filing your nails or cutting your nails to in fact diminish or to stop amplifications of this imbalance that exist between the growth force and the additional forces. I can give you one example. If you imagine that you can take your nail out of your finger and then you can put it on your desk as a flat. Now, the edge that is curved, if you want to avoid any problem, it has to follow a sort of parabola. We found that if the nail follows a parabola, the likelihood of developing conditions of your nails that are again, related to a sort of imbalance of growth and additions, is almost nil. Tim - Parabolic nail cutting is the future or in other words, model your manicure on a U shape. If you cut your nails this way, you should be able to avoid some pretty painful nail conditions. So, make sure to tell your manicurist. Mirko - Drones are basically flying robots or flying unmanned aerial vehicles. So, what they can do is they can take pictures from above, from the sky, but it can also interact with the environment and create structures, repair structures, or take samples of the soil or of water. Kat - We mostly hear about drones in the context of military spying or doing nasty things like dropping bombs and stuff like that. That's presumably not what you're about here. Mirko - Of course, there are a lot of ethical questions and discussions that happen around these areas. What's different from these big military drones is that they are basically airplanes. But the small drones that we can buy for a few pounds are fuelled by consumer electronics and cell phone technology. So, they are really cheap now and they are widely available. Kat - Now, I'm kind of a bit worried about the idea of lots of drones flying around that could take pictures of me. Would they take pictures of me while I'm sunbathing in my bikini? I don't really want that. How do I know what's a good drone or maybe a pervy drone? Mirko - Yeah. So I think we need to discuss this as a society, what is ethical use of drones? There are different questions that come to mind. One is on privacy i.e., not to film people when they don't want to be filmed. I think we need to protect that. But we also need to take care that drones don't do something that is potentially dangerous. That they're not in the hands of terrorists for example or that they're not carrying out tasks that are critical, or dangerous, or making life and death decisions. I think there are things that the human needs to be in the loop and we need to create a framework, an ethical framework of what should be allowed and what's not. Kat - So, we've got a couple sitting on the desk here. Talk to me about this one. This thing is I guess the size of the span of my hand. It's got 4 little helicopter blades sitting around something about the size of an egg I guess. What's this here? Mirko - So this, I would call it a nano quadcopter. It's very small and they can carry some sensors. We use those in research to swarm based control and swarm coordinated actions. We can have thousands of them that will be deployed from a bigger airplane or from a mother ship drone, and then create and interact together to collaborate and do things. Kat - Like a flock of these tiny things going out there. Mirko - Exactly. So, they could be in a flock that can build structures like termite woods in flocks, or even swarms collectively, or they can also just sample environments because we have many of them. Even if we lose part of them, even if we lose 80% let's say, they're very cheap and disposable. So, we still get a lot of data back. Kat - Okay, let's put this one to the test. Shall we do a little test flight here in the studio? Mirko - Let's do it. I can try. Kat - Off you go. Okay, so that seems to be slightly hard to control. How are you and your team working on how to control these little drones and take them out in the world? Mirko - Yeah, I'm not a very good pilot for these drones. So, that's why we work on autonomous control so they can control themselves based on on-board sensing and on-board intelligence. This is one of the key areas that we work on. What we also work on is on the platform design. So, creating new drones that can do new things such as repairing structures. Kat - So, how would that work? 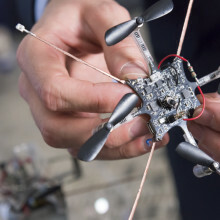 How could something that's a small little flying drone build a structure? How does that work? Mirko - For that, we look at nature and we look at the animal kingdom in particular, these birds that use their saliva to build nests. So these birds basically invented 3D printing many million years ago and so, we copy their principle of additive layer manufacturing to build up structures. Now, we do this with expanding foam on the drone. Kat - Unlike the birds. Mirko - No, the drones is a polyurethane foam or could use any kind of other chemicals that can layer up and just build up structures or repair structures. Kat - So, I can see that could be really useful for very far away environments or possibly really dangerous environments. I guess we heard about the Fukushima nuclear reactors. You wouldn't want to send people there to repair it, would you? Mirko - Yeah, that's exactly right. It's a very good application. There are areas where people don't want to go, but also importantly, there are areas or situations where quick response is required such as an oil spill or a leak in an oil pipeline. So, they're very important to quickly react to this, a drone could go and seal this leak very quickly and effectively. Kat - We've also heard recently in the news about the idea of delivering things with drones or online shopping or something like that. Perhaps even a pizza. I'm feeling quite peckish. Where are we with that? Mirko - I think we're pretty close to that. So, we're not so far, but there are a lot of challenges on how to fly drones safely in cities close to humans, how to avoid each other, how to have a regulatory framework that allows the regulation of the traffic, like air traffic control. But the technology is almost there for delivery. Kat - What could be some of the applications? I mean for example we're, in the grip of the Ebola crisis at the moment, one big problem is you can't get medications, you can't get tests through. Is this the kind of area where drones could really help? Mirko - I completely believe so. In fact, in areas where the infrastructure is not developed yet such as developing countries, so instead of going into building roads or building ground infrastructure, there's a big movement in creating aerial drone based delivery systems at a fraction of the cost that would be much faster and more effective for medical deliveries, blood supplies for example. Kat - Obviously, the need in some parts of the world is incredibly urgent for this, but how soon do you think we might start seeing little drone armies or drone swarms going out and doing these kind of things? Mirko - So, I think the drone delivery is very close, so we need to create legislation for that. We need air traffic control, but we also need on-board sensors and ways how to avoid each other, how to avoid obstacles. Then again, I think we can learn a lot from nature that does it already very, very effectively. Cruise settles into an automated vehicle. The car glides down the side of a building and onto a motorway, disappearing into a driverless fleet that navigates the city effortlessly. Of course, driverless cars have long been the realm of fantasy, but the world's fleet of self-driving cars could be operating much sooner than Minority Report predicted. Erik - I'm Erik Coelingh and I work as Senior Technical Leader for safety and driver support technologies at Volvo Cars. I'm responsible for a lot of the research and predevelopment of active safety systems that is systems that help drives to avoid collisions. But also, for the development of cars that can drive themselves. Graihagh - We've all seen in sci-fi movies, cars that can drive themselves. I'm sure I've seen one with Arnold Schwarzenegger who drives around in a driverless car in some action movie. How did this become a reality and why? Erik - Well, for a couple of years, we've been working on this collision avoiding systems. We see that it really makes a difference in reality. If you extrapolate this development, it becomes very obvious that we are slowly, step by step moving towards cars that can drive themselves. Graihagh - And we're actually standing just outside from the prototypes you've got here in the drizzling rain. So, let's jump in and have a drive. Erik - Okay, let's go. Graihagh - Now, I'm sure many of you are picturing a futuristic bubble of a car. I know I was, but actually, looking at it from the exterior, you couldn't tell. The interior wasn't too different either bar one key thing. Erik - So, in this car, I can just press one button and then the car will drive itself completely automatically. Please understand, this is a very early prototype. So also, if you look at the buttons, it's really prototype buttons. Graihagh - When you say prototype buttons, it's literally a bit of sticky tape that has ON written on it. so, is it literally a case of switching it on and off then? Erik - Yeah, it is. What we will do is that we will first drive maybe 10 minutes until we come to the ring road around Gothenburg. Erik - Right now, I've just released the steering wheel and the car is driving itself completely automatically. Graihagh - It's quite disconcerting. Erik - I've been doing this for awhile now and it just feels pretty un-dramatic. Graihagh - So, there wasn't a noticeable difference from switching from driving to an autonomous or driverless system. Any slight sort of jolt change in speed, but otherwise, it was pretty seamless. Erik - The only thing that you'll notice in this case was that there's no engine torque. So, you're slowing down really slowly. But otherwise, it's pretty smooth. Graihagh - The driving wheel made minor twists and turns, aligning itself to be precisely equidistant between the two line markers. It even accelerated to drive exactly 70kph, the speed limit of this ring road. And even though we didn't have to do any emergency stops for pedestrians or stray cats, Erik assures me that it would stop and has better reaction times than you or I. Why? Because it can sense cars for 200m around us, and pedestrians for 80m - further than what us mere mortals would ever be able to detect. But how does this all dancing and all singing car see its surroundings? Erik - The cars use very advanced sensor technology in order to monitor the traffic environment. So, we're using radars and cameras to detect cars, pedestrians, and we use a very accurate map, so we know exactly in which lane we are, what's happening around us. Based on that information, the car blends its path. So, we're planning what accelerations we should have, how to steer the car. The car is then executing that using electric motors and break system, etc. Graihagh - The camera in the front, what is that specifically used for if you're using the radar to sense all the cars around you? What's the camera being used for? Erik - We also use the camera to detect cars. But cameras can also read speed limits on signs. They can read the lane markers, a lot of different things. But we use different sensing principles - camera, laser and radar to really get a robust system. Because each sensing principle has its own advantages and disadvantages. By combining different physical principles, you can get rid of the worst disadvantages and make a really robust system that work almost all of the time. Graihagh - Will it be using things like cloud data, connecting to the internet and that sort of thing? Erik - Yeah. These self-driving cars, they will be continuously connected to the Cloud. One reason is that we always want to be able to have the latest map data. So for example, if there would be a construction site on these roads then we want to know exactly where this construction site is so that the car can prepare for it. Graihagh - So, my one concern with something being connected to the internet is that things can be very easily hacked. Does that mean someone could tamper with your car and potentially, even steal away its autonomy? Erik - Those kind of risks are never zero. They are really small. We are aware of the risks that people try to break into the car and we're working very hard to minimise the risk. But of course, you can never guarantee that the risk is zero. That's just never the case. Graihagh - So, as you mentioned before, we are driving a prototype. How are you going to go about making sure it is safe? Erik - When we're successful with the development and with the verification of the technology, then in 2017, we want to provide 100 vehicles that can drive themselves to customers in Gothenburg. So, these people can use their cars in daily life. They can drive to school, they can drive to work, whatever they want. But if they are on one of the selected roads, the ring road around Gutenberg, they have the possibility to press this button and have the car drive itself, so that he or she can do something else behind the steering wheel. Graihagh - I can see the immediate benefit of being able to disengage while stuck in that boring commuter traffic. I could hike back my chair, drink a coffee and check my emails, perhaps even checkout the latest news on, of course, nothing other than the new Naked Scientists app. But are there any benefits beyond using my time much more pleasurably? Erik - The benefits of self-driving can be that we can make traffic safer. We can make traffic more energy efficient, less polluting, but also, we can make a road traffic system that is more efficient. That is good at better traffic flow and better use the road capacity. Graihagh - So, we are just pulling back into Volvo's headquarters and our journey is complete. So, do you really see this as the future then? Is this what we're going to be driving around in 2054, in 50 years time? Erik - Well, I think it will happen. The big question is, when it will happen. But in 2017, we'll have 100 cars. If that is successful, then we really have reached the stepping stone towards a road transportation system with self-driving cars that is much more sustainable. 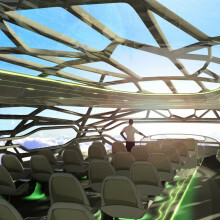 The space age is upon us, with Virgin Galactic offering tickets to space for $250,000 but when will it become the norm? 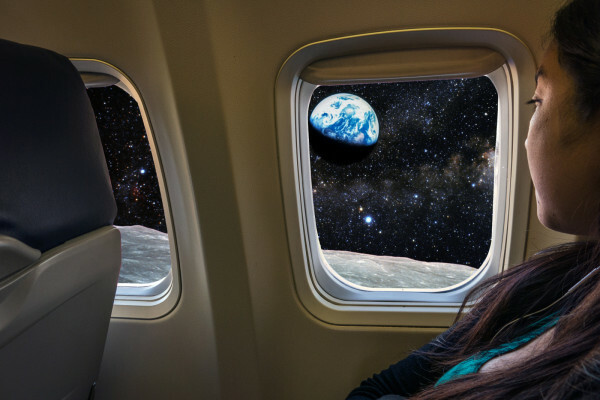 Aeroplanes might be getting much more passenger-friendly but it looks as though the destination of choice for this century will be space. 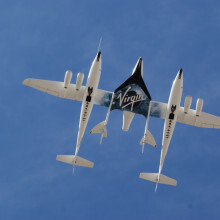 Make your reservations now though - more than 700 people - reportedly including astrophysicist Stephen Hawking and pop star Justin Bieber - are waiting to gain official status as Space Cowboys, each forking out in the region of a quarter of a million Dollars to hop aboard Virgin Galactic's SpaceShipTwo. Ten years ago this month, SpaceShipOne won the $10 million Ansari X Prize and Virgin Galactic have since been developing it to form SpaceShipTwo. But SpaceShipTwo wouldn't have been possible without the help of the X Prize, which was a not-for-profit organisation that awards money to radical ideas that will bring about breakthroughs for the benefit of humanity. Gregg - Well, it's really huge. SpaceShipOne, which won the Ansari XPRIZE, is the size of a 4-person light plane that you'd find at an airport any place in the world. SpaceShipTwo is quite a bit larger. Whereas SpaceShipOne could fly you and me and one other person to 100 km altitude, if we're flying on SpaceShipTwo, we have two pilots and six people can fly in the back and they can unstrapp and float around in zero gravity for about five minutes during a flight. So, it's a radically larger aircraft. Chris - So the bottom line is, strapped into your seat on SpaceShipTwo, but it's on the back of a bigger vehicle, an airplane, which gets you airborne in the first place. How does it get into space? Gregg - It hangs actually below the carrier aircraft, which has two fuselages. So some of your friends might get to see you off from altitude. It drops away from the carrier plane, after about an hours flight to get to launch altitude. It ignites its rocket engine, which is essentially powered by the same material that you have in the tires of your car, made to burn very rapidly using an exotic oxidiser that is usually called laughing gas, nitrous oxide. The nitrous makes the synthetic rubber burn very rapidly and that provides the thrust to accelerate you to the speeds required to get you to 100 km which is the so-called Kármán line, the line above which everyone agrees you're in space. Chris - How are the people recovered from space? They have their 6 minutes of floating around. They, presumably, are not going to re-dock with the aircraft that got them halfway there in the first place. They've got to get down to the ground. How do you recover SpaceShipTwo? Gregg - SpaceShipTwo glides to a landing on the surface of the Earth. So, it is an unpowered glider. It will land at places like Mojave where it's been landing for its test flights and also, a brand new space port in New Mexico, in the vicinity of White Sands Missile Range in New Mexico, south of Albuquerque. Chris - Tell us about the danger side of this. What will happen to the people if something goes wrong and is there a chance that's something is going to go wrong? Gregg - These people are subjecting themselves to something that is more dangerous than driving around in cars. Probably, more dangerous than flying themselves around in a light aircraft, probably, less dangerous than scaling tall mountains, which people do all the time. But it is not a risk-free activity. These people will be real pioneers and in my book, heroes. They'll be doing the same exact thing that folks like Allen Shepard and Gus Grissom did in 1961, the year that humans first went into space. Since then less than 600 people have flown to space. So, the 700 folks who have made deposits to fly on SpaceShipTwo will double the population of human beings that have had the opportunity to see the Earth from space. They're going to do something else. The reason that we did the XPRIZE was not so rich white people could fly in space - although they will. It's so that we can have a completely different financial basis for doing space flight and open up space for lots of useful purposes for all of us on Earth. The economic problem with space flight is there's not enough of it. In a really great year, there are maybe 15 or 20 commercial satellites for the entire world that need to be launched. So, if there were only 15 or 20 airplane take-offs in a year, none of us could afford to fly. We, back 15 or 16 years ago, were thinking: what's the perfect ideal commercial payloads of the future that will require thousands of take-offs and landings maybe even a week? We realised, it's us, people, self replicating carbon based payloads that you can make using common things you find around the house. Chris - So, it's your view then that the idea of pushing forward and making this a tourist thing is that the money will follow the people. This will open up new opportunities. Gregg - Absolutely, there are many. There's not any one specific one, although there are some huge ones. The problem is, the cost of getting even just our tools in the space right now is about £4,000 a kilogram. So, it's really expensive. We've got to get those costs and the way they do it is to do more of it. That's what space tourism will be. It'll be a stepping stone to a large array of future opportunities. We're already seeing it as a result of our XPRIZE. There are now some re-usable space vehicles that have flown literally hundreds of times to take scientific payloads up and back, whereas the normal rocket used for that purpose, flies once or statistically, a little bit less than once because they're not all successful. Chris - Will you be getting a ticket? Gregg - I hope so. I won't get one when the price is what it is today. It's a bit expensive for my taste, but many of the various providers that are in this area have said that their initial fee will come down considerably, maybe as much as the factor of 4 or 5 over the initial prices. So, when the cost of making a once in a lifetime trip to space to see the earth from space is about the cost of getting a midrange new car, I think there will be many people who will do it. In fact, the studies indicate that you can maximise your profit as a business entity if the cost is somewhere in the vicinity of about £12,000. Chris - There's an interview in the Daily Telegraph, one of the British broadsheets, this weekend with a Chinese businessman who's just bought one of the ticket and he appropriately enough is called, in Chinese, the equivalent of Sky-walker! Gregg - That's lovely. How nice is that? Hopefully, he won't have to do any walking at all during his flight. Maybe floating would be a better name for him - Sky-Floater. 49:06 - How will life end on Earth? What will cause the end of life on planet Earth? Will it be the when the sun dies or something else? Paul - Humans may survive, breeding, warring, poisoning, destroying and plundering forever but I fear, nothing habitable will be left behind, for humans are cancer to all life. Graihagh - Whereas Jeremy thought life was just to hardy to ever go extinct. Jeremy - Life is persistent stuff. NASA tried to create a sterile room to build Mars rovers to prevent interplanetary contamination. What did they find? Bacteria that evolved to eat the paint in the sterile room. Graihagh - So, will life always find a way to endure, no matter what happens to Earth? To find out, we spoke to Astronomer Royal, Martin Reese from Cambridge University. 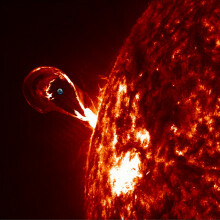 Martin - We know that the sun will die in about 6 billion years. When that happens, it'll flare up, become a red giant and engulf the inner planets and end any life remaining on Earth. Long before that, in fact, life have become uncomfortable on Earth because the sun is getting brighter all the time. So after about 1 billion years from today, the ocean would start to boil. Graihagh - The Atlantic boiling, our sun exploding... 6 billion years from now, do we have any hope? Martin - I would expect it in a few hundred years, there'll be communities living away from the Earth on asteroids or on Mars and they will in fact, use genetic technology and cyborg technology to modify themselves. So, they'll be post humans already. But if we imagine that the Earth has ahead of it, more time that it's taken to go all the way from simple organisms to humans, then we can imagine that by the time the sun dies, there'll be life descended from human life, all through the galaxy perhaps and taking many different forms. Mark - I've been taking part in November which is a fundraising for cancer research where men raise money by growing moustache over the course of the month of November. Hence, that 'M' in November. It's been 10 years since I've grown any hair on my chain and this year, it's growing white. The hair on my head isn't white, it's not grey. My question is, why is my facial hair growing white and I don't really want people to think I'm dying it. 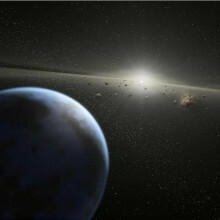 Next How will life end on Earth?